Rancho de Español is located in La Guácima de Alajuela, a small village 18 miles northwest of San José, capital of the country, and about ten minutes away from the international airport, Juan Santamaría. In this authentic town, people speak only Spanish, the families preserve the real “tico” lifestyle and enjoy hosting foreigners. 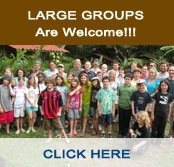 Most of these families are related to each other which permits our students to interact with more than one host family. We guarantee you a memorable stay and excellent value for your money. Rancho de Español has a spacious, park-like campus with a swimming pool which offers a relaxing atmosphere to students. Students can combine classes with swimming, playing soccer, basketball or volleyball, or resting under the shade of a tree. Classes are often held in open-air classrooms surrounded by beautiful gardens and a wide variety of trees, flowers, birds and other animals. Safety is a plus at Rancho de Español for our students due to the small size of the town. Rancho de Español also offers services to make your Costa Rica trip unforgettable.